THE AVERAGE COST of buying a typical three-bed home in Dublin city has jumped by €17,000 in the last three months. That’s according to the Real Estate Alliance Average House Price Survey, which looks at the sale prices of typical three-bed semi-detached homes across the country. According to its Q3 report, the average cost of this type of home in Dublin city postcodes (not including north or south county Dublin) rose by €17,000 to €431,500 in the three months since June. In total over the past 12 months the price has gone up by 11.2%. This compares to house prices rising 6% between September 2015 to 2016. 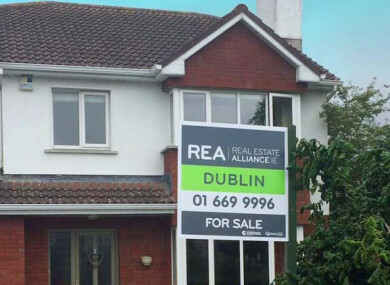 In Dublin city, house prices have shot up by over 15% in the last year. To complete the equation, first-time buyers are not seeing the three-bed semis coming through in sufficient numbers. Hynes said that although the number of planning permissions granted was up this year, enough houses still weren’t being created to meet demand. Hynes said that it could be 2020 before the marketplace begins to normalise. Outside of Dublin, the commuter counties saw an increase of 2.7% this quarter, with average house now selling for €229,300. The other main cities – Cork, Galway and Limerick – saw slower growth than average over the past three months. Meanwhile, house prices in Longford have increased by 32% in the past year. However, the county still has the cheapest semi-detached homes in the country. A typical three-bedroom house would cost you €90,000, up from €68,000 in September 2016. Email “The cost of a three-bed house in Dublin city has gone up by €17,000 in three months”. Feedback on “The cost of a three-bed house in Dublin city has gone up by €17,000 in three months”.